Southampton suffered a 1-0 home defeat to Stoke in what may prove Claude Puel's final game as manager. Their club's hierarchy had revealed plans to review his position at the season's end, offering him minimal support, and after their latest defeat and inability to score for a fifth straight game at home, may act despite finishing eighth in the Premier League. Increasing hostility from the club's supporters will also add further pressure on the Frenchman's position, whose team lost after a second-half header from Peter Crouch that took Stoke to 13th. Concerns either team, with little to play for beyond the additional B#1.9million bonus awarded for each place in the league table, would have little desire to exert themselves receded from the opening minute when Stoke threatened. From space on the left wing, Erik Pieters aimed a cross towards Crouch that missed the forward but fell at the far post to Mame Biram Diouf, who struck powerfully at the near post where Fraser Forster dived to tip wide. A lull may have followed but even if neither team's creativity convinced, they both made errors that led to promising chances. In the 27th minute Cedric Soares, under little pressure, played a back pass into space that almost sent Crouch through on Forster, only for his lack of pace to allow Maya Yoshida to recover and stretch to challenge and deflect over the crossbar. Southampton had also threatened through Ryan Bertrand and Charlie Austin, and Stoke when Xherdan Shaqiri stabbed over from the edge of the area, while on the stroke of half-time when Soares leaped to clear Diouf's header off the line. The hosts had not scored at St Mary's during their past four home fixtures, but that run almost ended when Jack Butland needlessly conceded possession. The goalkeeper, making only his fifth appearance of the season, came out of his area to collect the ball but a heavy touch ensured it ran clear, from where Nathan Redmond collected, and despite little time and space with his back to goal from 40 yards he impressively turned and chipped against the crossbar. Austin had rightly had a second-half strike ruled out for offside when, in the 60th minute, Stoke took the lead. From space on the right wing, Geoff Cameron crossed towards Crouch and, with ease amid a challenge from the small Cedric, as he once did so often for the home team, the forward routinely headed into the back of the net. 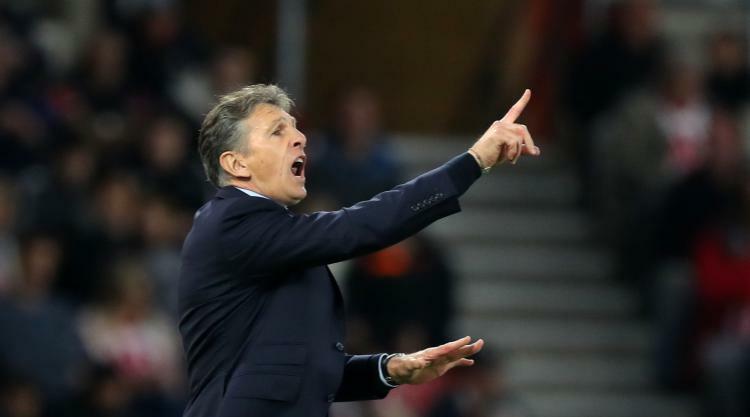 Puel responded by substituting Austin and Tadic for Manolo Gabbiadini and club-record signing Sofiane Boufal, but as he did so he was subjected to chants of "You don't know what you're doing" by Southampton's supporters. They twice came close to an equalising goal, first in the 73rd minute, when after Bruno Martins Indi had cleared Bertrand's cross, Butland produced a double-reaction save to deny first Steven Davis and then James Ward-Prowse from close range. In the 80th, Gabbiadini was sent one-on-one with Butland after Davis' pass, but the goalkeeper impressively remained composed to save and then denied both Boufal and again Gabbiadini shortly afterwards. At the final whistle Southampton's dissatisfied supporters again booed at the outcome, as loudly as they have done all season. Puel, and the club's board, likely share their feelings.